Zeigler's was right on South Orange Avenue, on the same block as Garrs Bakery and Sunny B's. Half a block down from Munn Ave. by Vailsburg park. I have so many fond memories of hanging out there when I was a little girl. Gus Zeigler was the original owner, and Ritchie ran the place. My dad helped out there allot. When Gus retired (I think to Texas) Ritchie, took over and became the new owner. He would let me get behind the counter and help heat up the little soups, and put the sandwiches in the little toaster oven. Guess that's why I'm still working in food service!!! 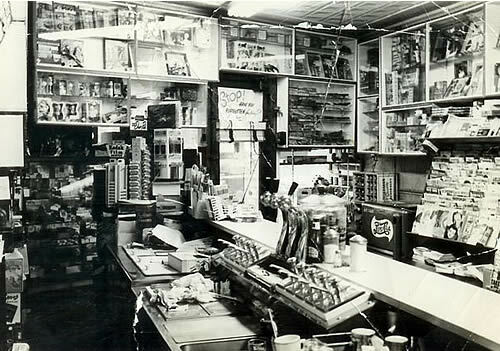 He sold everything, tobacco, magazines, little gifts, temporary tattoos, dolls....anything you can think of as well as the regular luncheonette and newspaper stand items. He died in the late 70's or early 80's if I remember correctly. I had already moved to Union by 1970, but dad still helped out there for years. Its so incredibly sad to drive down South Orange Avenue now, I just keep that old black and white photo to remind me of the good times. As a matter of fact, at Easter, my sister and I always had to show off our new coats and bonnets over there, Mr. Zeigler's apartment was right above the store, and we would go pick up our Easter Baskets from Mrs. Zeigler.